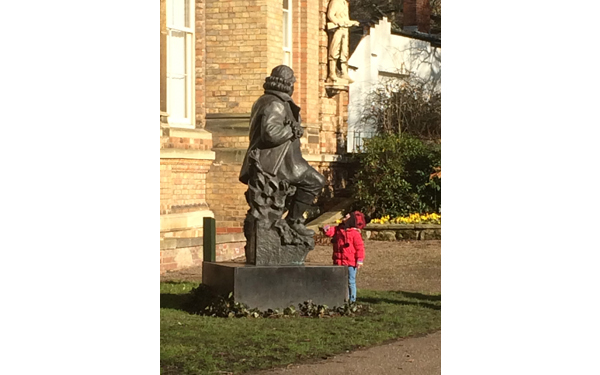 In the picturesque setting of Beacon Park Museum Gardens, Erasmus sits perched on the edge of his seat. A founding member of the Lunar society, Erasmus (1731-1802) was a physician, philosopher, poet, and inventor. 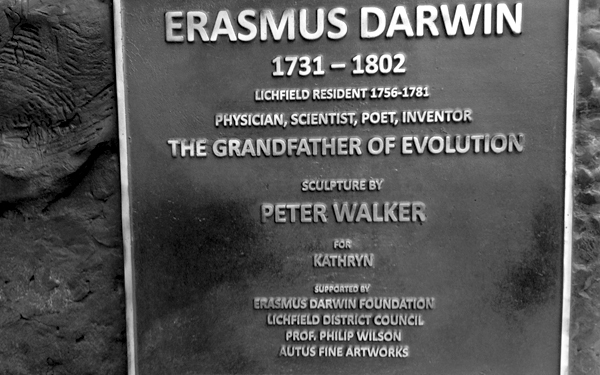 The 7ft Bronze shows Erasmus holding a shell in his left hand in recognition of his theoretical discovery -‘E Conchis Omnia’ meaning ‘Everything from shells’- and under his right arm he grasps his ‘Commonplace book’ full of inventions, scientific knowledge and ideas- the beginning of the theory of evolution which he passed on to his grandson Charles Darwin. To the keen viewer of art it may be seen that this sculpture adopts the pose of Michelangelo’s Moses, who similarly holds under his right arm, tablets of commandments as a means of physical proof of belief, yet here Erasmus holds new evidence, of ideas and thoughts and change. All of Erasmus Darwin’s character is depicted including his flaws, a large personality and his porch belly! 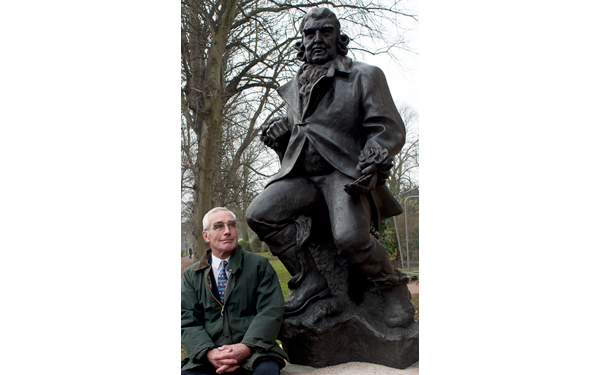 Even the ripples of his jacket have been produced to appear like waves upon the ocean, and the vines around his legs acknowledge Darwin’s poetic works and links to nature. It is as though he is part of nature as well as showing humanities independence and desire to move forward. The plinth itself also reflects this – an acknowledgement of industry. Erasmus here is not coy, contented or arrogant, but purposeful, intent and moving forward, ready to offer proof of his theories to those who pass and care to stop and look. 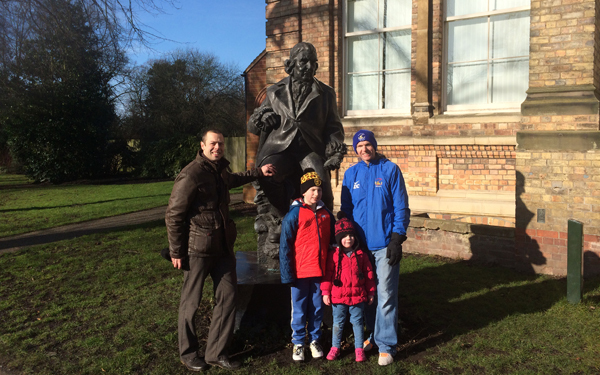 The Princess Royal visited the statue of Erasmus and spoke with the sculptor about the piece in April 2013.